Acumatica has ranked the easiest ERP system to use for the past two years and the fastest growing cloud ERP solution available. With NO PER USER license cost, Acumatica enables even smaller businesses to have the best ERP and repair functionality within reach of all your system users. We developed ProMRO within Acumatica due to its ease of use, deep functionality, and no per user license cost for companies with over 10 users. 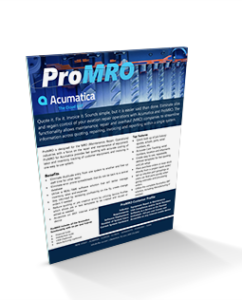 ProMRO for Acumatica is designed for the small to mid-sized MRO. Our experienced team combined with a significant number of years of industry knowledge, enables us to help you leverage the power of ProMRO and the complete set of Acumatica’s modules from financials to inventory, customer management, and even manufacturing. Use the modules you need, add other modules as your business changes. Visit the Acumatica Marketplace to read our listing on ProMRO.